Marshalls Rhino MSF Boston Flat Top Illuminated Bollard. For a contemporary stylish low level illumined bollard New Bollards Limited stainless steel model offers safety and security to your car parks, paths or entrances. Provided as standard with a SON 70 watt Lamp for mains 240 voltage operation. 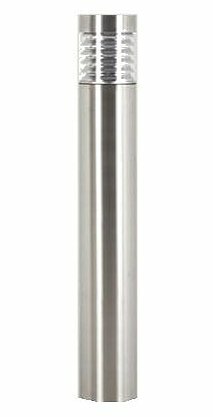 The sleek contemporary flat top bollards features a stainless steel body and top with a louvred glass illuminated head. Manufactured to the high standards Marshalls demand, the illuminated bollards are fully guaranteed for 12 months, delivered free and affordably priced.